Today’s consumers foster inherent skepticism toward traditional advertising. Instead, they prefer and rely on recommendations from people they know and trust. To effectively reach these consumers, you need brand advocates – individuals who have first-hand knowledge of your funeral home and can share their positive experiences through word-of-mouth referrals. Your brand advocates are well placed to offer credible recommendations to their peers. They sing your praises to others in the community without incentives like coupons, discounts or special offers. They do it because you have earned it, and they are often your most effective recruiters, a compelling blend of advocacy and authenticity. The most successful funeral businesses rely on word-of-mouth recommendations and testimonials to increase brand awareness in their community. But to truly capitalize on this valuable pool of promoters, you need to know how to identify and mobilize your brand advocates. The most obvious place to look for brand advocates is among your client families. These individuals are well acquainted with your goods and services because they’ve experienced them firsthand. This makes them valuable sources of information about your business. However, not every customer makes an effective brand advocate. To ensure you’re focusing your attention on those individuals who are going to have the most impact on your business, you should identify customers who have had memorable and rich experiences with your funeral home. Storytelling is an essential part of word-of-mouth recommendations for funeral businesses. No one truly wants to shop for a funeral – caskets, vaults, urns and monuments are not fun to buy. Very few people are going to be compelled to use your services because they hear you have an impressive collection of 18-gauge steel caskets. Instead, they respond to story-based recommendations that describe experiences and emotions. And the most effective stories are the memorable ones – the ones that get told and retold from person to person. My family recently experienced two losses that illustrate the importance of memorable services. When my grandmother passed away, we planned what many of us think of as a “traditional” service: an immediate cremation followed by a visitation for friends and community members, a memorial service at the local church, a lunch reception at the community center and a short graveside service at the Veterans cemetery. While the day was certainly meaningful for my family, it was not necessarily memorable to those who attended. When my cousin died a year later, we planned a very different service. We held the funeral in the high school gymnasium, with his name lit up on the scoreboard above a red bowtie – his favorite accessory. Every member of his graduating class wore bowties, even some of his coaches. During the service, dozens of teachers and friends shared stories, some sweet, others funny – all memorable. The luncheon afterward was even catered by his favorite barbecue restaurant. His service was memorable – so much so that many in the community are still talking about it three years later. Consider the last 10 services you performed at your funeral home. How many of them were truly memorable? Can you picture attendees sharing stories from the service with their friends and relatives? Will people still be talking about that experience a year from now? Two years? Ten? If you’re not sure, you likely need to spend some time working with your staff on creative memorialization and personalization so that each and every family leaves your funeral home with a memorable experience that they are excited to share with everyone they know. When looking for brand advocates, you should also consider the breadth of experience a family has had with your business. Someone who selected direct cremation is unlikely to have much to say about your funeral home – good or bad. They simply haven’t had much exposure to you or your business. On the other hand, consider the credibility and influence of an individual who met with you in a prearrangement setting for their spouse; interacted with your staff at the first viewing, visitation and memorial service; took advantage of your aftercare efforts; and then returned to plan and fund their own funeral. A customer who has this kind of rich experience with you and your staff is much more likely to be a loyal, informed advocate for your business. How can you mobilize brand advocates? Unfortunately, identifying your most effective brand advocates is the easy part. Learning to motivate and deploy them effectively is much more difficult. To mobilize your brand advocates, you first need to build and nurture meaningful relationships with them. This first part is likely something that already comes naturally to you – after all, you work in a relational profession. You likely know many of your client families before they come in for an arrangement conference, and if not, you are skilled at establishing a connection with them within a few minutes of meeting. However, it’s just as important to continue to foster those relationships long after the immediate need has passed. There are few tangible ways to do this. First, take advantage of as many fact-to-face interactions as you can. That means dropping off paperwork at a widow’s home instead of mailing it, offering to transport flowers to the family’s home so they don’t have to pack them into their station wagon, and taking time to greet your customers whenever you see them out in the community. You may even consider calling the surviving spouse three or four weeks after the service just to check in, or taking them out for coffee so they have something to look forward to once all their friends have stopped calling and visiting. You should also leverage opportunities to continue to provide service to families through your existing aftercare. Make sure every family knows what’s available – newsletters, emails, grief support groups, etc. Let them know why they’re important and offer to connect them with others who have found value in participating in those programs. Whenever you have events at your funeral home, like open houses, memorial services or holiday events, make sure you invite your brand advocates. Attending provides them with more exposure to your business and gives them one more thing to talk about with their friends and relatives. The last – and most important – step in mobilizing brand advocates is asking your client families for referrals. 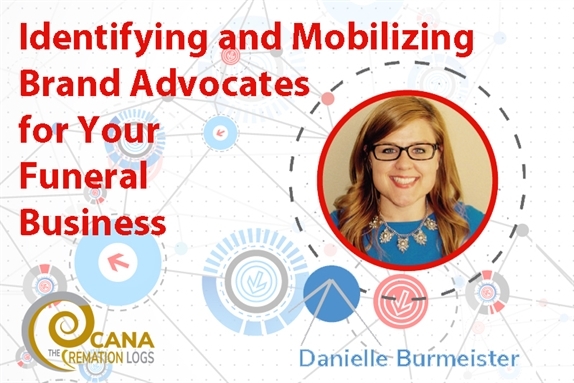 This is often an uncomfortable thing for funeral professionals to do, but it’s a key part of leveraging brand advocates to promote your business. Often, customers who have had great experiences with your business are already inclined to promote you in their communities, but it’s still a good idea to remind them that it’s a valuable thing for them to do. One final note: The best way you can ensure you are identifying and mobilizing your brand advocates is to build the process into your standard operations. Make sure everyone on your staff understands the importance of providing memorable service to your client families. Train them to be on the lookout for individuals who have rich experiences with your firm and stories to share about your services. Then set expectations for how you will ask families for testimonials and ensure that every member of your team knows how valuable those testimonials can be for your funeral business. Danielle Burmeister grew up in an apartment above her parents’ funeral home, where she cleaned cars, arranged flowers, and played “Taps” for graveside services. Some of her earliest memories include family dinners squeezed between visitations and road trips to local and national funeral association conventions. 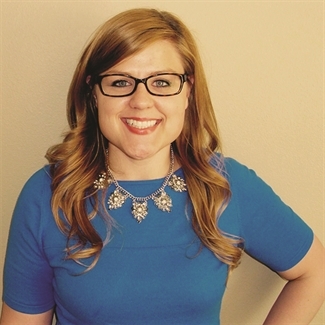 Now, Burmeister works as Marketing Communications Lead at Homesteaders Life Company, a national leader in providing products and services to support the funding of advance funeral plans. In her current role, she offers a unique perspective on blending the day-to-day demands of a funeral business with creative and comprehensive marketing strategy. Follow her on Twitter @burmeisterd1. Nearly every movement in American history has begun with a handful of hearty men guiding the reins of change and progress. The cremation movement in America is no different. In its early years, a strong cast of characters brought cremation from the dark of superstition into the light of knowledge. F. Julius LeMoyne (builder of the first crematory in the U.S.), Henry Steel Olcott (co-founder of the Theosophical Society), and Dr. Hugo Erichsen (Detroit medical practitioner and founder of CANA), among others, all played important roles in the formation of America’s cremation movement. However, if men were at the head of the early movement, then women most certainly helped to determine the direction of the men’s efforts and encouraged the growing public acceptance of cremation customs. Women were at the forefront in turning the cremation movement into a reality in America because they were among the first people to be cremated in the earliest crematories in the country. The third person cremated in a modern crematory in the United States was Jane Pitman (Bragg), wife of Benn Pitman, the stenographer during the trial of President Lincoln’s assassins. In 1885, Peggy Smith was the first person cremated at Buffalo Cremation Co. (now Forest Lawn Cemetery in New York). Barbara Schorr was the first person cremated at Detroit Crematorium in 1887 (now Woodmere-Detroit Crematorium). In 1886, Olive A. Bird was the first person cremated in Southern California Crematory (now Angelus-Rosedale Cemetery), and in 1888, Elizabeth Todd Terry was the first person cremated at Missouri Crematory (now Valhalla’s Hillcrest Abbey Crematory). Suffragist Lucy Stone was the first person cremated at Massachusetts Crematory, in 1893 (now Forest Hills Cemetery). These pioneering women were so ahead of their time that in several cases their bodies had to be stored while crematory construction was completed. I choose the luminous path of light rather than the dark slow road of the valley of the shadow of death. Holding these opinions, I have the purpose to help forward progressive movements even in my latest hours, and hence hereby decree that the earthly mantle which I shall drop ere long – shall be swiftly enfolded in flames and rendered powerless to harmfully effect the health of the living. This quotation proved so meaningful to the cremation movement that a plaque bearing these words hangs in nearly every historic columbarium in the country. Followers of the cremation movement increased as the century turned. Authors of the time penned essays informing the public about the cremation option. Sheba Hargreaves was among many who produced pamphlets urging cremation and inurnment. She painted cremation as a beautiful process to be supported and embraced by all who truly cared for their dead. During the “Memorial Idea” period of cremation’s history, which began in the late 1920s, there was a concerted effort to ensure that cremated remains were memorialized with the same dignity and dedication as full remains. The leading men of the era, including Lawrence Moore (Chapel of the Chimes in Oakland, CA), Herbert Hargrave (Chapel of the Light in Fresno, CA) and Clifford Zell (Valhalla Chapel of Memories in St. Louis, MO), were strongly supported in their activities by their female counterparts—women such as Alta Phillips (Hollywood Columbarium in Hollywood, CA) and Teresina Morgan (Chapel of Memories in Oakland, CA). At the Chapel of the Chimes in Oakland, an entire cadre of women formed the backbone of the staff. They were charged with describing the Memorial Idea for the families who called upon the crematory for service. Moore felt the women could, like no one else, guide families through the daunting process of choosing a permanent memorial. With the dedication of evangelists, men taught other men the ‘gospel of cremation,’ women of cremation were the true apostles of ‘the good news’ of this ‘sanitary and aesthetic method’ and sold this idea to the families they served. 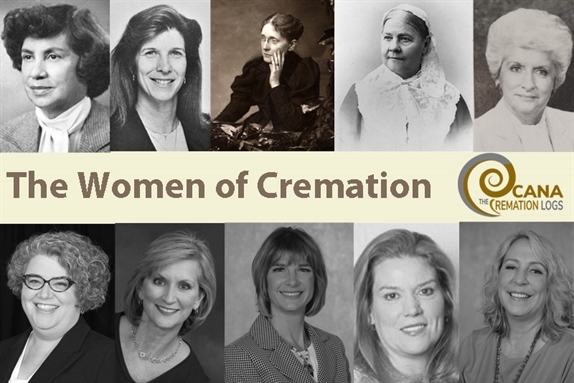 Women’s influence brought many of the most beautiful cremation memorials into existence. Well-known architect Julia Morgan redesigned and constructed one of the most stunning columbaria in the country at the Chapel of the Chimes in Oakland in 1928. This famed chapel would ultimately be named after cremationist Frances Willard and incorporate her famous sentiment. Eventually, this golden age of the “Memorial Idea” began to take a new course in the 1960s. Driven by many factors, the change was primarily due to a movement toward simplicity. In 1963, Jessica Mitford wrote her satirical expose The American Way of Death. Propelled by the excitement that Mitford’s book spawned, the idea of simple direct cremation began to take hold. By the late 1970s the memorial idea started to lose its hold on cremation, and, as it did, the Cremation Association of North America did everything possible to maintain the integrity of what they viewed as the right course: the permanent memorialization of cremated remains. Women were actively involved in the association’s efforts. In 1979, the Cremation Association of North America elected not only its first female president, but also the first female president in the history of any death care association. Genevieve “Jinger” Zell, widow of CANA’s past president Clifford F. Zell, Jr., took the reins of the association during a time when cremation was experiencing a major transformation. The U.S. cremation rate reached a tipping point of 10% during her presidency. She was one of the most ardent supporters devoted to continuing CANA’s ideals of inurnment and permanent memorialization, staunchly advocating against the processing of cremated remains. After Zell, women continued attain positions of leadership. Mary Helen Tripp was elected president in 1991, followed by Corrine Olvey in 1997, and, most recently, Sheri Stahl in 2015. Today, CANA boasts some of the most forward-thinking women in the profession: Caressa Hughes, Robbie Pape, Elisa Krcilek, and Erin Whitaker are making their mark in the history of cremation by serving as board members, officers, and advisors of the association that is on the cutting edge of all things cremation. CANA’s executive director is Barbara Kemmis. Under her tutelage, the association has gone from being dependent on a management company to being entirely stand-alone and self-sufficient. Kemmis has been instrumental in the reformation of the industry’s original and foremost Crematory Operations Certification Program™ (COCP™). The COCP was reviewed and revised and a whole new catalog of online professional education programs were developed by CANA’s Education Director Jennifer Head. If you read The Cremationist Magazine, what you read is the direct result of the hard work of Sara Corkery, editor of the trade journal. From past to future, women have played, and will always continue to play, a very important role in all movements in our country. In our ever-evolving society, who better to guide cremation and CANA’s future? This post is the first in our series on the history of cremation to get ready for the opening of The History of Cremation exhibition at the National Museum of Funeral History. Learn more about the exhibit and how you can contribute on the museum’s website. 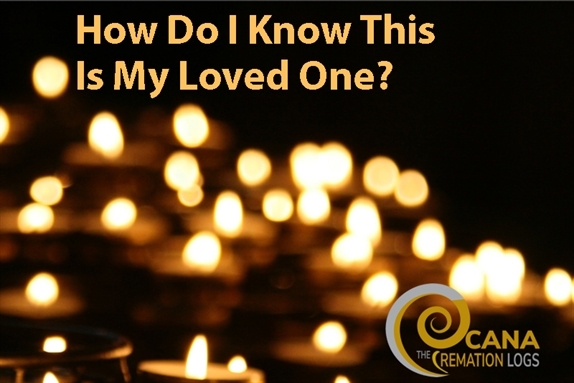 Our second post looks at how the treatment of cremated remains influenced memorialization practices and memorialization practices influenced our treatment of cremated remains. Read on! "How do I know this is my loved one?" How do I know this is my loved one? A Chain of Custody procedure is never more important than in moments like these. Here, you can demonstrate your commitment to a family and leave them with confidence to trust you with the care of their loved one. But what do we mean by chain of custody? Every step of your work in the handling of each case must be documented accurately and carefully: custody, control, transfer, analysis, and disposition. CANA recommends crematory facilities make a description of the cremation practice, policy, and procedures available to the family. And, even more importantly, the policy must by followed every time, no exceptions. Many forms are used to document the steps in the cremation process. It may seem that some of the forms repeat the same information, but it is important to maintain complete, accurate, and cross-referenced records. Your firm should have a comprehensive written procedure guide outlining the steps in the process from receipt of the deceased to return of the cremated remains, and it should include the associated forms, verification, and documentation required. Chain of custody documentation, including the ID tag, ensure the identity of the remains and provide objective evidence of identification post-cremation. Keep in mind that state and provincial laws governing documentation and record keeping range widely, and every crematory operator must learn what laws specifically apply to their location(s). But chain of custody goes beyond merely complying with regulations. A thorough and followed chain of custody demonstrates professionalism by establishing and adhering to policies and procedures consistent with industry best practices. Every step of the process needs to be performed in absolute accordance with policies and procedures that have been designed to prevent errors. Once the remains are in the custody of the crematory, it is important to track and record every step of the cremation process. In the event that there are ever any questions about any case, you will be able to demonstrate that the remains were appropriately handled at every stage. Policies, procedures, forms and all of the paperwork in the world are worthless without compliance and consistency. Doing it the same way every time helps assure that mistakes are not made. If you never do it differently, you will do it right every time. Documenting chain of custody is key to avoiding lawsuits for negligence in this area. Every step of the way must be recorded without exception, and the records must be archived and accessible if needed. Inaccurate, incomplete, or unfollowed documentation is worse than not having it. Be thorough and complete with every entry every time. Write legibly when filling out forms. A document that you cannot read is worthless. If you leave a field blank it will raise a red flag. Was that field forgotten? Or was it really not applicable? If there is a space to record information and you either do not have that information or it doesn’t apply to this individual, mark that fact down in the space. Document retention and filing methods are important as well. If you can’t find something, even if it was filled out perfectly, it doesn’t exist. If you use a third party for your cremation families, you must still prepare chain of custody procedures and require the crematory you work with to meet or exceed your standards. Ask to see their policies and tour their facility. Conduct random checks of the crematory and audit their paperwork as you would your own. You must be able to stand by the practices of their crematory and clearly describe the chain of custody to the families you serve. If you operate as a third party crematory serving funeral homes, you know better than most the complications that can occur when working with a remote facility. Not only should any crematory working as a third party maintain the standards described above, but you must maintain your policies and follow the procedures for your various clients. Holding their staff to the standards you hold your own requires diligence. Keeping open communication and maintaining transparency allows your clients and their families to rest easy with loved ones in your care. Despite the importance of maintaining clear and comprehensive documentation throughout every step of the process, too many facilities make the same types of easily avoided errors. Overconfidence in experience, employees spread too thin, sacrificing thoroughness for efficiency, and choosing the company over compliance are common errors but indefensible. A key thing to remember about liability risk is how small, seemingly minor lapses can have huge consequences for the operator and the facility. How do you know your chain of custody meets appropriate standards? Walk through your documentation with a hypothetical case (like the one below) and make sure you track the remains throughout the entire process: from when you first take custody of the remains until they leave your control. Management should perform regular audits of the crematory’s record keeping to assure that all the procedures are being consistently performed. Because cremation has become the number one area of liability in the funeral profession, solid documentation accompanied by iron-clad policies and procedures are the best way to demonstrate the truth and ease the mind of a concerned family member. What follows is a case study of a cremation gone wrong. The case is an amalgam of true events which have occurred in businesses over the past several years. The decedent is Peggy Jones of Anywhere, USA. Peggy died alone in her home in July at the age of 62. Although she was married when she died, Peggy had been separated from her husband for 20 years. At the time of her death, Peggy was living with Mr. Smith, her partner of 18 years. Mr. Smith was traveling overseas when Peggy died, and thus, her remains were not discovered until several days after her death. Peggy’s remains were discovered when a neighbor noted an odor emanating from Peggy’s home. The local authorities were notified, who in turn contacted your facility regarding the death. The medical examiner staff member was on scene when your removal team arrived. Having located Peggy’s driver’s license, the ME staff tagged the remains correctly, i.e., “Peggy Jones.” However, the remains were verbally identified as “Peggy Jonas.” The body bag contained a tag which also identified the deceased as “Peggy Jonas.” Finally, although her given name was “Peggy,” the ME staff prepared documents identifying the deceased as “Margaret” Jones. From the outset, Peggy’s remains had been identified in three ways - two of which were inaccurate. The easiest way to cremate the wrong remains is improper identification. What should have happened . . . The removal staff should have personally examined the remains to confirm the identification affixed thereto. If any discrepancy among the documents, bag and tag affixed to the remains existed, then that discrepancy should have been resolved prior at removal. The remains were placed into refrigeration at your facility. The refrigeration log reflected that the remains of Peggy Jonas were placed into refrigeration at 8:42 a.m. Due to the uncertainty over the cause of her unattended death, Mr. Smith requested that a private autopsy be conducted by State U. State U logged the remains out of refrigeration at your funeral facility at 5:00 p.m. that same day, having presented documents identifying Peggy as M. Jones. State U logged Peggy’s remains back into your care the following morning at 8:00 a.m., again, as M. Jones. Each and every document must identify the remains correctly. You should have ensured that Peggy’s remains were identified correctly and in exactly the same way on each document making reference to them. Effective tracking and accurate cross-reference, is a must. Cremation is an irreversible, unstoppable process. Of course, one would think that the statement goes without saying, and yet, every cremation customer is reminded of the permanence of the cremation process. What makes the phrase worth repeating here, however, is that too often cremation providers fail to recognize the weight of the statement. Failing to follow standard practices jeopardize the trust of the cremation-buying public, as well as your license to practice. By now, you may be thinking: “Any licensee that would make the type of mistakes described in this case doesn’t deserve to serve the cremation buying public.” But, mistakes just like these can be made every day, not from malice but from negligence and ignorance. Keep current on your state’s requirements related to identification, authorization and disposition. Audit your procedures to make sure they are thorough and followed by everyone. Doing so will protect you and your families from the devastation which can be caused by a simple error. A crematory operator is a vital part of the overall process of turning a dead body into a living memory for a family. It is absurd to think that any good operator would want to do anything less than a perfect job for the family of the deceased. After all, it’s more about the family than anything else, right? Excerpted from The Cremationist, Vol 54, Issue 1: “All Systems Go 4 Record-Keeping” by Larry Stuart, Jr. of Cremation Strategies & Consulting and CANA’s Crematory Operations Certification Program™ (COCP™) Module 4: Chain of Custody. Special thanks for Wendy Russell Weiner of Broad & Cassel for lending her experience and expertise with the case and important lessons we can all learn from. Members can read the full article with specific recommendations paperwork to use and proper filing in Vol. 54, No. 1 Issue of The Cremationist. Not a member? Consider joining your business to access this and all archives of The Cremationist plus resources and statistics to help you find solutions for all aspects of your business -- only $470. Always obtain expert legal advice on policies and procedures for compliance and liability review. Contact CANA’s own Legal Counsel Lara Price, Wendy Russell Wiener’s firm, Broad & Cassel, or any death care legal advisor. You can also learn more by contacting Cremation Strategies & Consulting for consultation on improving your systems. Throughout his experience as President of Crematory Manufacturing & Service, Inc., Larry Stuart, Jr. has seen, first hand, the negative impact that poor crematory operations can bring about, both in the front and back of the house. Larry has written articles, developed cremation curricula, and spoken at numerous professional events. He has trained and certified thousands of cremation professionals across North America, all with a mission to advance the safety and efficiency of cremation facilities and the safety of their employees, and to foster a more positive impact on our community and our environment. As the founder of Cremation Strategies & Consulting, Larry continues his mission to educate our industry peers, our customers, and the public about cremation, its history, its cultural significance as part of the funeral rite, its impact on the environment, and operational best practices. Wendy Russell Wiener is a partner at Broad and Cassel, LLP, and the chair of the regulatory department. Wiener practices regulatory insurance law and regulatory death care industry law, representing entities and individuals who interact with the administrative agencies that regulate all aspects of insurance and the death care industry. She represents clients in all types of licensing (for individuals and entities) and disciplinary matters, practice before the administrative tribunal, state and federal courts and interaction with regulators. Wiener is a member of the Federation of Regulatory Counsel (FORC), a limited group of lawyers who focus their practices on regulatory insurance law. She is a frequent contributor to the organization’s quarterly journal. Wiener is an active member of various professional and community organizations and is the former president of Temple Israel in Tallahassee. She is co-chair of the Tallahassee Jewish Food Festival and of the Southern Shakespeare Festival (Festival Day). She has served as past president of Raising a Healthy Child, Inc., and is involved with the ACT Board of the Young Actors Theatre. Do you have a budget for training and development? If you do, is it only for mandatory training required for maintaining licensure? If you answered no to the first question, or yes to the second question, read on. Sadly, most people only pay for continuing education classes only because they have to. As long as they have the credits they need, that’s all that matters. In that case, they look for the bare minimum – something that offers the least amount of work for the most amount of credits at the cheapest rate. You all know what I’m talking about. Those $50 online classes that get you 4 hours of continuing education credit. Four hours and $50 later, you haven’t actually continued your education or developed professionally because few people learn anything from a “class” where you read endless pages of content, or “watch” boring narrated slides while you’re really catching up on CANA’s blog. But what if the money spent on that required continuing education could actually help boost your bottom line? Successful companies know that training and development (T&D), as well as succession planning and anything related to workforce development, should be an integral part of your business strategy. Your people are your most important asset, so they should receive the time, energy and investment that shows it. What do successful companies do? They make a Competency Model – they outline all of the knowledge, skills and abilities (KSAs) a person needs to be successful in a given job or job area. Training dollars are focused on filling the gap between the skills employees have and those they need; since the competencies are tied to business goals, you are spending money on personnel (read: professional) development that will directly impact the bottom line. These competency models are also used in succession planning and career growth. When you have them available for all positions, employees know what is expected of them, especially if they want to be promoted or move to a different position in the company. When hiring new employees, the models help you identify what training you may or may not need to provide if you hire a particular person. If improving your bottom line isn’t enough motivation to focus on T&D, maybe keeping qualified employees will. Are your employees getting poached by other firms because of the industry’s talent shortage? Continued opportunities for development and advancement keeps employees engaged and reduces turnover. What about the retirement of the Baby Boomers? It’s no secret that a skills gap exists between what employers need and the skills many of our future employees have. If you’re facing the looming retirement of experienced staff, getting new employees in and up to speed quickly is essential. That means starting now with comprehensive succession and T&D plans. “But wait!” you say. “Paying for classes is one thing. But the travel expenses, lodging and food, in addition to the lost work time, it all adds up!” Yes, it does, and I have several responses. First, the long-term payoff of having well-trained staff more than covers the classes, the travel expenses and the lost work time (or it should, if you choose quality training programs). Plus, the commitment you demonstrate to your employees makes them feel valued and that you are invested in their future. Second, properly trained and qualified staff generally leads to lower legal risk, which is priceless – ask anyone who has been sued. So how can you provide quality education in a more budget friendly way? Online programs are a great option since they eliminate the travel. I earned my Master’s Degree in 2005 and the program was entirely online; it was cutting edge for its time. I remember having to watch video lectures every week for class, mailed to me on VHS tapes, and promptly falling asleep on the couch within 20 minutes. BORING! Don’t get me wrong, the program was tough, and I put the work in to prove I was worthy of the degree (just ask me about my work product sample!). But studies show, and my personal experience agrees, an interactive online learning experience is more effective. It wasn’t available back then, but we’re capable of this now, 13 years later, with all the technology advancements. Unfortunately, if you want to take quality online education that actually increases the bottom line, you may struggle to find it. Remember that $50 class for four hours of credit? That’s not the quality I mean. Research shows that lectures aren’t effective for adults to learn, yet it continues to be the delivery mechanism of choice—especially for online courses—because it’s easy for those putting the presentation together. Truly valuable online opportunities can be rare. Maybe that’s why there are still states, like Pennsylvania, that don’t accept continuing education credits obtained through online or distance learning methods. They know that there haven’t been many—if any—truly effective online programs available. CANA is changing that. Though it can be costly and time intensive and requires a unique skill set to develop, the use of online education that is designed following best practices is now an expectation within the most successful companies. Unfortunately, there are still many industries that lag behind in this area—ours being one of them. This is why it’s important for CANA to set the standard. Our association needs to show what quality online continuing education looks and feels like. But how do you know if you are investing in quality education, especially when it’s offered online? There are three key criteria to consider before purchasing an online course. Learners should be active participants in the learning experience. Notice I don’t use the word attendee or registrant. The word learner implies that participants are actually going to contribute something and not sit passively. The course should include a combination of video, images, animations, and audio and should not simply be a narrated slide deck. Most importantly, it should require the learner to think and to do. This helps them process the information and think about how they will apply it to their daily tasks. That’s where we see the return on investment. Next time you think about using any education, but especially online education, think quality and return on investment. Let that be your guide to selecting courses that will work for you and your staff. Not sure how to get started developing a defined professional development plan for your employees? I’d love to talk to you. Call 312-245-1077 or email me Jennifer@cremationassociation.org and I'll work with you to achieve your goals. A former high school science teacher, Jennifer Head began working for the American Foundry Society in 2005 after receiving her Master’s Degree in Education. She was responsible for the administration and operations of the AFS Institute’s programs and facilities, and initiated a complete redesign of Institute programming, including both classroom and online courses. 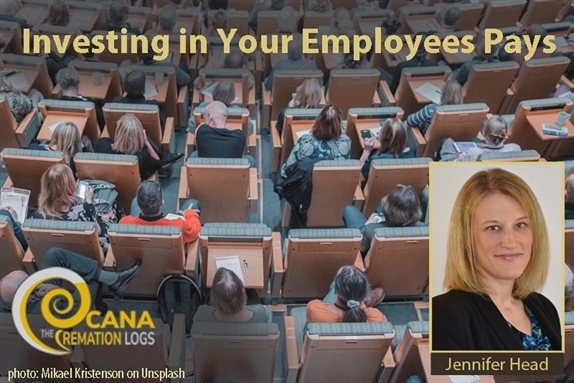 A Certified Professional in Learning and Performance (CPLP), she brings to CANA a wealth of experience in best practices for workplace learning. This year’s Symposium will be our best yet. The committee and staff selected the theme, Connecting the Dots, to help attendees find success by combining critical elements of running a business into one comprehensive strategy. From beginning to end, we’ll build on the content presented, wrapping with a big picture view of how it all fits together. In brief: The foundation comes from establishing and understanding the power of your story. From there, tell that story though your brand advocates or key staff and community members. Their online reviews leverage your position to improve your online reputation and get found. Once you have their attention, keep it by transforming their interactions with you into something memorable, especially with the addition of a therapy dog. But none of this can succeed without evaluating these individual steps and making changes for continuous improvement. We are so excited to bring these experts together for you in Vegas, we know you’re going to love it! This event took the work of many people. Here’s what CANA’s Symposium committee members are excited about, and why you need to register now to join us at this remarkable event. Jennifer Head, CANA Education Director – I’m most excited for our Keynote Speaker, Kelly Swanson. Not only is she an award-winning storyteller who can take you right to the heart of a problem, she’s hilarious! Her message on crafting the right story is so critical for our industry right now. As I attended a presentation given by a different storytelling expert, I watched how, in a matter of minutes, she transformed a story that did nothing emotionally to one that tugged at my heartstrings and made me happy to buy. That’s how you create brand advocates- people who tell your story for you. Because at the end of the day, it’s not about you. It’s about them. And you have to let them know that through your story. Don’t believe me? Let Kelly explain it to you at the Symposium. She’ll present two dynamic sessions at the conference, and whether you own a business or work for one, whether you are a practitioner or supplier, her message will resonate with you. I promise. Lindsey Ballard, Ballard-Sunder Funeral & Cremation – Our committee considers many options when selecting a hotel, and we’re excited to be returning to the Paris for a second year. The Paris Las Vegas Hotel is such a wonderful place to be when you're in Vegas. It's visually stunning, loaded with restaurants and entertainment, and the central location on the famed strip can't be beat. Our meeting rooms for the symposium are beautiful and provide the perfect ambience for our event. Of course, I’m really looking forward to the Therapy Pet panel presentation. My dog Fletcher has been going through training to become a therapy dog at our funeral home, and I’ve learned a lot over the last year. He won’t be coming, but I have lots of pictures! Fellow committee member Robert Hunsaker as well as CANA member J.P. Di Troia will join me as we share our therapy dog journeys with you and provide some guidance about adding one to your team. We’ll also host one of the roundtables during the Coffee Klatch. I hope to see you there! Sheri Stahl, The Island Funeral Home & Crematory – While CANA focuses on providing quality programming and exhibits, we also know that Vegas is the entertainment capital of the world. We like to end our evenings early, so you can continue the networking on your own as you go out and enjoy all that Glitter Gulch has to offer. Whether you hit the tables and slots, take in a show, or enjoy the variety of cuisine (and famous buffets), Las Vegas has something for everyone. And if you can’t decide, you can stay in and enjoy all that Paris has to offer. Personally, I can't wait to see all my CANA peeps! Scott MacKenzie, MacKenzie Vault, Inc. – As supplier liaison for the CANA board and chair of the committee, my focus is usually on the exhibits. We have over 40 exhibitors committed to supporting you the same way you support families who choose cremation. 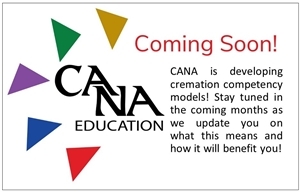 CANA’s Symposium is the best place to learn about new cremation products and services. Vendors from almost every area – technology, products, supplies, equipment, personalization and more – will be on-hand to show you what’s new and talk about what families are asking for as the personalization and DIY trend continues to grow. Your vendors are your best partners as your businesses continue to evolve to meet the demands of an ever-changing industry. This one-day, highly interactive workshop places you with marketers and experienced providers to answer your questions and find new solutions to your preneed challenges. We have experts on using demographic data and targeting the right markets, advice on selling value over price with the staff you have or specialists, and stories from experience on administering and selling across multiple brands online and in-person. We’re excited to see the discussions that emerge. Limited spots available, register now! 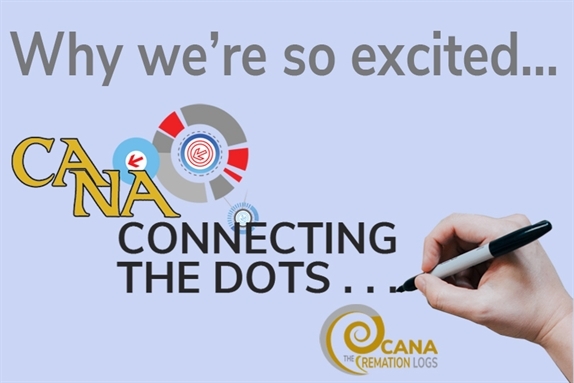 Join us for fun and quality professional development February 6-8 at CANA's 2018 Cremation Symposium! Register today.